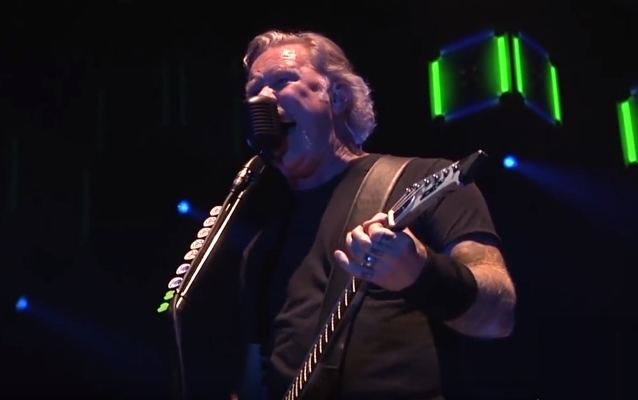 Professionally filmed video footage of METALLICA performing the song "Holier Than Thou" on February 28 at Don Haskins Center in El Paso, Texas can be seen below. Before the El Paso concert, METALLICA handed over a check for $10,000 to El Pasoans Fighting Hunger. The band also provided two free tickets for the organization to use to help recruit more volunteers. "They were so gracious and humble. When you calculate how much they give in each city that they could keep for themselves, it's just heartwarming to me," Terri Wyatt, chief development officer for the organization, told the El Paso Times. METALLICA's All Within My Hands non-profit foundation was launched in 2017 to help creating sustainable communities by tackling the issues of hunger and workforce education and encouraging volunteerism.